Simplicity in cooking is something I am learning these days. It’s not necessary for you to add all the spices and more ingredients to cook delicious food. There were times when I couldn’t think of cooking without adding onions, tomatoes and garlic with minimum half a dozen of spices to jazz it up. With time I feel more confident in choosing just few spices that is right for the main vegetables. In other words I don’t panic and hop around when I have to use just few ingredients to cook something exceptionally delicious. These days I am seeing different me when it comes to cooking. I have stopped harassing the vegetables with extra handful of herbs and suffocating them with overdose of spices. I see dramatic change in my style of cooking. It’s like seeing mirror image of my mother who always cooks exceptionally great food with just few ingredients. Well, I may never be able to reach her standard of cooking but I am on my way of becoming at least one decent cook. Such simplicity in cooking is very common when it comes to Udupi-Mangalorean cuisine. Everyday food is cooked with very few ingredients and lots of love and coconut. Coconut is the heart of this region’s cuisine and you will find most of the recipes using it in one form or other. Don’t be surprised to see people getting little carried away when it comes to Coconut be it coconut oil, gratings, desiccated coconut, coconut milk and even coconut water. Coconut not only dazzles any dish it touches but also gives it very distinct flavour by easily complimenting any vegetables, herbs and spices it is blended with. 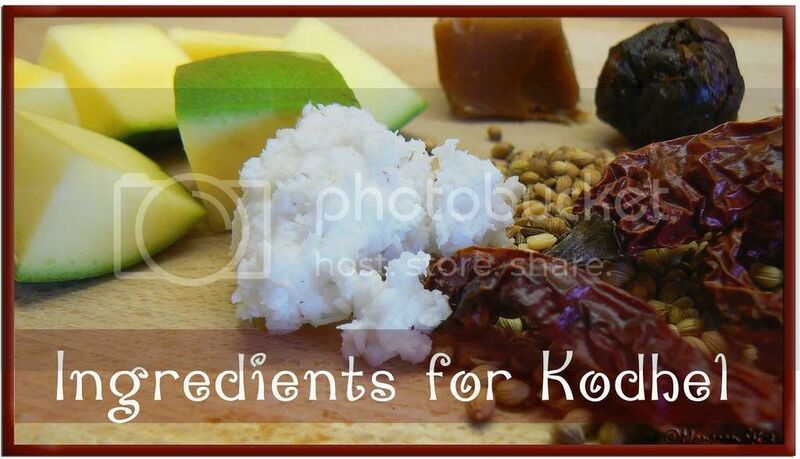 One such recipe is Kodhel or Kodheal, a coconut based curry from Mangalore. Recipe is quite simple and straightforward, vegetables cooked with a ground paste of fresh coconut and few handfuls of spices. Sounds simple isn’t it? But the taste is unforgettable. Every time I make Kodhel it tastes different when used with different vegetables. From humble vegetables to royal fruits, the choice of main ingredient is many. This time I made summer special and my all time favourite Raw Mango Kodhel using Totapuri Mango which is a best choice for this recipe. Don’t fret if you don’t find Totapuri mangoes. Instead go for those mangoes which have mild sweet note with sourness. The rich and vibrant golden red colour of the gravy comes from special type of dry red chillies called Byadagi Menasu/Chilli which comes from Byadagi region in North Karnataka and is a must for Managlorean cuisine. This Raw Mango Kodhel where sweet and sour Totapuri mangoes are cooked in lightly spiced coconut gravy is delight to every foodie’s senses. And off this goes to Suganya who is guest hosting this month’s AFAM-Coconut. Oh yes, Coconut is really a fruit and like many of you I too learnt it recently. Cook cubed mango pieces in 3-3½ cups of water adding jaggery and salt to taste for between 7-10 mins on a medium flame. Make sure that the mangoes are just cooked and its peel change to dirty green colour. Mean while, dry roast coriander seeds, cumin seeds, dry red chillies, urad dal and methi seeds for about 1 min in a medium flame till they turn light brown in colour and gives out nice aroma. Grind these roasted spices with coconut, tamarind pulp and just enough water to very smooth paste. Add this ground paste to mango pieces and mix well. Add little water if needed to get required consitancy of base gravy. Cook this mixture for another 5-7 minutes and bring it to gentle boil. Heat oil in a tadka pan and add mustard, dry red chillies, hing and curry leaves. Transfer this tempering to the curry when mustard starts to pop and splutter. Mix well and cover and keep it aside covered for about 10 mins for all the flavours to blend well. 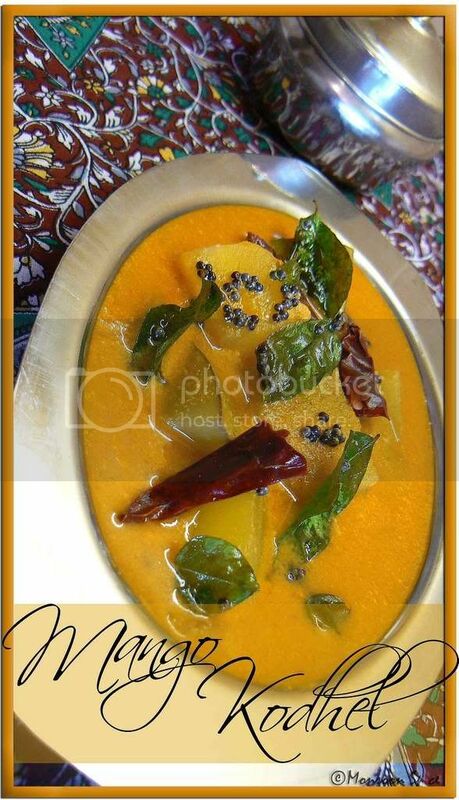 Serve this delicious Raw Mango Kodhel with Rosematta or Basmati Rice or with Dosa and Idli and enjoy. While cooking mangoes make sure that you don’t over cook them as it is important for mangoes to retain their shape and not become mushy. Don’t cook for too long once you add ground mixture of coconut. This Kodhel tastes great the next day when all the flavours are blended well. I love this. Mangoes and koddels two of my favorites :). yummy!!!!!! It looks sooooo good!!!! With the new herb garden on my patio, I too was suffocating dishes with an overdose of flavors. I realized, stepped back and back on right track :). Though I grew up with Italian food, I adore Asian foods, especially coconut milk in curries. So the thought of having coconut in all types of meals all day long, sounds like heaven to me. Your Kodhel looks amazing. AHH!! It's going to be this kodhel when I get that totapuri next time. I love that variety of mango. leave me and totapuri alone and it will be gone in no time!! and love your thinking on letting the veggies breathe and for their flavour to come out! and you had made Aamras? !! ?? hey sia i love this kodel. nice pics. Just right for the season. Mangoes and coconut, how can anything be wrong with that super duper combo. Hey, the ingredients here are so close and yet so different to a mango side we make. Will blog that soon. Mango Kodhel nice curry. Iam going to try this. now i'll be chanting 'totapuri' 'totapuri' in my sleep. if i can't find it at least i can dream about it. This dish is new to me. I love mangoes and coconut, so I will to make this if I get good mangoes! So many delicious recipes with lovely photos! 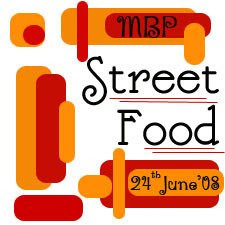 Girl..your picture speaks thousand words..loved the kodhel.I love any recipe with raw mango..:D.Already made a dish for MBP, waiting to be posted. that looks so good, sia. love all kinds of mangalorean food... now i'm gonna put those mangoes to good use! Last day for kids at school.I have been so busy picking them up from school since Friday. Glad it's over from tomorrow. 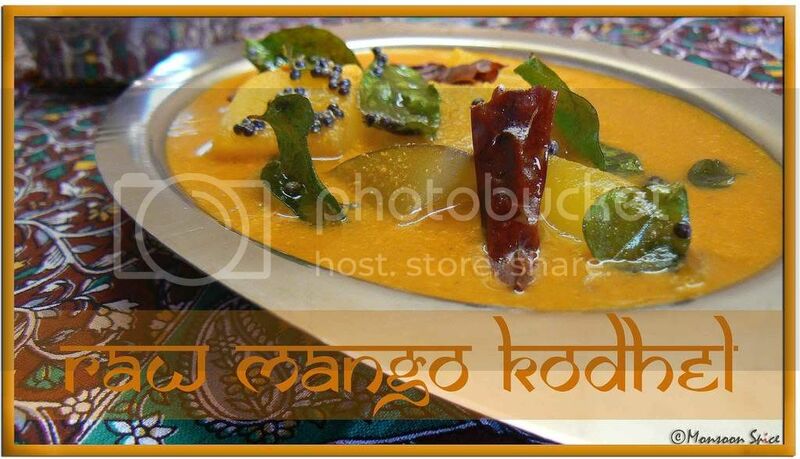 Kodhel looks mouthwatering, can't get green mangoes but could use the gravy. Good one. Sia, raw mangoes in Kodhel sounds just great!! We make something similar called Rosse. I love the sourness of mango in a coconut curry..Lovely dish..